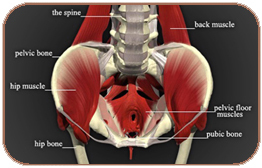 What is the pelvic floor - The pelvic floor is a group of muscles that close off the bottom of your pelvis. They are attached from the pubic bone to the tail bone front to back and side to side by ligaments. What do the pelvic floor muscles do? - The pelvic floor muscles are responsible for helping to move the bones of the pelvis, support the pelvic organs in both women and men for urination, bowel movements and sexual function and act as one of your “core” muscles along with your abdominal, back, hip muscles and your respiratory diaphragm. Pelvic floor problems are common in both women and men but they can be treated with physical therapy. What types of diagnoses are related to pelvic floor problems? Post-Surgical Pain including Adhesions - Examples in women are: Hysterectomy, C-Section Scars, Laparoscopy and Endometriosis, Pelvic Organ Prolapse Repairs and abdominal or pelvic cancer treatments. Examples in men are: Hernia Repair, Prostate Surgery, Abdominal or pelvic cancer treatments. Your privacy is of utmost importance to us! Your initial evaluation and all treatments take place only with your therapist in a one on one, private setting. However, if you would like to bring a partner or confidant, we encourage you to bring them to your appointments. We use a comprehensive treatment approach that includes evaluation of how your unique problem is affecting your entire body. What type of Treatments does Specialized Physical Therapy offer for PF Problems?